Windshield repair is simply repairing the rock chip damage or stone chip damage of your windshield. 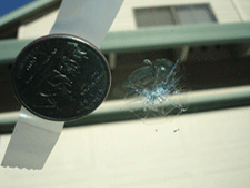 Chip damage, if repaired soon after the rock chip or stone chip can prevent further crack damage to the windshield. Contacting Jolliff Glass as soon as you notice the rock chip or stone chip is as simple as placing a phone call or using our online contact form. Jolliff Glass provides mobile auto glass repair & replacement services throughout Central Illinois. Our staff of qualified auto glass installers can have your vehicle repaired or have your car windshield replaced while you continue your daily tasks. Tempered Glass (door glass, back glass, etc.) has been "tempered"...put through a special process where it is heated, then rapidly cooled. Tempered glass doesn't shatter on impact. Rather, it disintegrates into dull-edged pieces, almost like pebbles. There are no large, jagged pieces of glass to injure the driver or passengers.